Podcasting from Fort Collins Colorado, this is the StartupFoCo podcast episode 5. I am your host Vanessa Pagan, gearing up for the 2018 Techstars Startup Week Fort Collins. In this pre-event episode, we have 8 guests who remind us to think bigger and go further. Let’s get into startup week speaker interviews. Joe Somodi – FoCo Speaks Out! [00:00:00] Vanessa Pagan: Thanks for taking the time to join. Lu you are the new head of the Techstars Foundation, and you are keynoting the Fort Collins Startup Week 2018 your panel is going to be a Wednesday February 28 at 9 a.m.. And you’re going to be talking about leading Techstars Foundation. Lu can you tell us a little bit about what you hope attendees get from hearing you share your message? Lu Cordova: I think that anyone coming to startup week in general should get a sense of community that welcomes them into this vast ecosystem of entrepreneurship the Techstars Foundation is about making that community a diverse one. Where everyone feels included. We feel the only barrier to entrepreneurship should be dreaming something worthy. Vanessa Pagan: Wow. That’s a great vision for what community can look like and reaching out beyond our borders so as Startup Week. What do you hope an attendee can find out if it’s their first time coming like what would you hope that they get out of it and what advice would you give [00:01:00] them? Lu Cordova: Each person coming to a Techstars week like this comes with their own idea of what they could do they come with it their own dream or with the curiosity. They don’t even know what they want to do. They just are drawn to some reason, and I would like them to feel welcomed to come in. Sometimes it’s intimidating to see other people who look trendy and look like they know what they’re doing and maybe you’re from a background that hasn’t had access to that before. You have access. Come in. You will be welcomed and I want people to feel that way when they come here and with the foundation we’`re doing specific initiatives to help them feel more wanted and more connected, and that’s what I’m hoping to talk about what some of these initiatives will be. How they can plug into them, and how they get can get that access that they haven’t had before. Vanessa Pagan: That’s great, and Lou from your vast experience and background is there a top lesson learned that you can share with attendees? Lu Cordova: You know Vanessa, I think that my biggest lesson is yet to be learned because I have to figure out what diversity means when you step [00:02:00] outside the United States. I’ve been to over 60 countries, and I will tell you the cultures are so different. What diversity and inclusion means to us is not what it means in another place. So that’s why we focus on barriers. I’ve got to learn how to break down those barriers internationally for entrepreneurs. Vanessa Pagan: That’s a great mission. I’m often reminded that when I travel outside of the US, my identity is not the state I was born in it’s the citizenship that I hold as an American that defines who I am when I leave my home country and when we break down those borders. We become not just our nationality, but we become our common denominator of human beings. Lu Cordova: It’s so true and in fact I was grateful that you had said you know here’s a bonus thing if you want to thank somebody in the community, and it goes back to that because I want to thank you for the opportunity to finally publicly, thank Pat Stryker. And it’s not because of all the amazing philanthropic work she’s done or it in a very circuitous way Striker is a cause of why I want up in [00:03:00] this position. The reason I want to thank her is for something she did almost 20 years ago that has an impact today. My daughter was in a Bilingual School at the time in Boulder in my effort to make her culturally diverse so that she could become a global citizen. Pat saved bilingual education in Colorado. That means she saved bi-cultural understanding and now my daughter is in Tunisia as we speak. She was in Honduras earlier Kenya before that and she’s working around the world to help government be more transparent in what they do. She wouldn’t be doing that if she hadn’t had the bicultural, bilingual education that she got when she was in school. So I hope to meet Pat someday, never actually met her but I’d love to thank her in person for doing what so many of us aspire to do which is actually make the world a better place. Vanessa Pagan: Thank you for sharing that beautiful story with Pat Stryker. Because the seeds that she planted of her efforts over 20 years ago have such a huge impact on you and your daughter and the ability to break down cultural silos. I’m also rooting for you to meet her in person when you come to Fort [00:04:00] Collins Startup Week. Lu Cordova: Yes, well the Techstars credo in general is give first. And once you understand what that means you will see the amazing effect it has on everything you do and how it brings out the very best in others. So I hope after my keynote people will walk away thinking. this is my time to give first, and then they will see what it brings to the world. Vanessa Pagan: That’s wonderful. Thank you so much for sharing your knowledge your personal story of how seeds that we plants can have long ranging effects into the future and make a difference in people’s lives who may not even be born yet. Lu Cordova: Yes well my pleasure. Thanks Vanessa. Vanessa Pagan: On the line I have Denny Otsuga who’s the director of Venture Community Development of the Rockies Venture Club. Denny is moderating several panels related to secrets of attracting Angels investors part 1, part 2, part 3, and also bootstrapping your business. He’s also going to be speaking with the Mayor on the session called Arting up Science New Directions in Cross [00:05:00] Discipline Collaboration. Hi Denny. Thanks for joining me, so you’re being very active in the 2018 Startup W eek at Fort Collins. What do you hope attendees get out of attending this week? Denny Utsuga: So I think people are people going to get out of Fort Collins Startup Week is they get to see how active the start-up activities is in the city. As well as how many artists are in the city. Most of the startup teams are small and artists tend to be just working on on their own, and they’re scattered throughout the city, so it’s really hard to see how active they are because they’re so spread out but with events like this they all come out and you get to see them all at once and that really provide scale and the level of activities in the city. So I think that’s a biggest thing people are going to get out of this. Vanessa Pagan: It’s great. And of the panels that you’re involved in what do you hope attendees [00:06:00] get out of learning about what it’s like to attract Angel Investors. Denny Utsuga: Yeah, so I’m organizing four sessions and attending why I’m as a speaker, and my main theme for all of these is Capital Access. In simple terms, it’s basically how people get their initial chunk of money or seed capital to start implementing their ideas and dreams so there several different ways to get to those capital and hopefully people attending my session will get better idea of how to approach Angel Investors or start making money right away and bootstrap business and grow their business. Vanessa Pagan: That’s great. I know I’m personally going to be attending the bootstrapping session. I know you’ve got three other, sessions, but I’m bootstrap almost all my companies, so I can’t wait to hear what you have to say in that one great the next question. I wanted to ask you is if there something that you share from your background and experience that you can share with a startup week [00:07:00] attendee as one of your Lessons Learned. Denny Utsuga: Yeah, I said before I think entrepreneurs and artists tend to work on their own or in a small team, so I think it’s a really important for them to realize that they’re part of a bigger community and attending sessions or participating in startup week. They get to meet their peers, and then exchange knowledge and experience and most importantly create a new network and even create a community. with meetup or other way so that they will find a way to communicate and network among themselves.I think that’s a really important thing for entrepreneurs and artists I think. Vanessa Pagan: Wonderful. Thank you and the next question I have is related to what do you see as the vision for the future of Fort Collins? Denny Utsuga: So I think I am going on my six year living in Fort Collins, and I’ve been bringing [00:08:00] in the knowledge experience and the capital to Fort Collins community, and I really do believe in the huge potential in Fort Collins, and it just need to be capitalized so that it can take off. And my vision for future of Fort Collins is really becoming a model city for a dynamic and vibrant venture community, which I really believe is integral part of developing triple bottom-line community with sustainable social environmental and economic growth, and that’s that’s kind of my vision and hope for this community. Vanessa Pagan: That’s a great answer. I would like you to share triple bottom when you say that. What are the triple? What are the three? Denny Utsuga: Yeah, so triple bottom line is a concept that takes into account social, environmental and economic growth all-in-one [00:09:00] and not have lopsided growth in any one of them. That always considering other factors at the community go and stuff Fort Colin is expected to double in size and next 20 years or so and it’s really important to make sure we have open space and making sure that everybody in the communities that care of while pursuing economic growth for the community. So that’s kind of that triple bottom line concept. Vanessa Pagan: Thank you for giving us some context to what that means and what that can look like because there’s so much potential for the future of Fort Collins, and I also hope that it is a very stable foundation that we’re growing on top of. Vanessa Pagan: Great. That’s it. Those were wonderful answers. Thank you so much Denny. Denny Utsuga: Alright. Thank you very much. Vanessa Pagan: So as a very quick introduction Barbara is the director of the Women’s Investors Network for the Rocky Venture club in Denver, Colorado, and your AMA as us in the Reddit world [00:10:00] call it is really a chance for the Fort Collins community to be able to ask you whatever questions that they have in mind, is that right? Barbara Bauer: Absolutely. Everything from why is it so hard to get early stage investment to why is it so hard to be an early stage entrepreneur. Vanessa Pagan: A lot of it why is it so hard questions, I’m feeling. Barbara Bauer: Well, and I think if you were to talk to entrepreneurs and also to experienced investors all of us would agree that it takes a lot of hard work and a lot of initiative, persistence and flexibility to find a match between the early stage venture founder and the right investor. Most early stage founders seek funding from friends and family. That’s a very classic way to start and probably almost always required as a way to start, but once that early-stage founder [00:11:00] is really ready to expand her company. She’s looking for an investor that has the right match for the phase, in the industry sector she’s in, the kind of venture it is. Is it a you know a classic software venture? Is it a retail opportunity? Whatever it is you really have to work hard to find the right investor and people with experience can help. So that’s really the motivation for the session because we want early-stage Founders people with good ideas who have really started their company and really want to grow it to success we want them to have as much information from our experience as possible so they’re not wasting their time on anything. You know if you’re an early-stage entrepreneur unless you’ve done it before it’s all new and it’s pretty [00:12:00] obscure. Barbara Bauer: Well, it’s it’s clear that Fort Collins like many other communities in Colorado is just full of people with good ideas. And lots of hard work, and it’s a challenge though to connect people with those ideas and ventures to investors Rockies Venture Club has a collaboration with a group of investors in Fort Collins and so once a month we are up their meeting with investors and presenting pitches from early stage companies. We also host a monthly event called a mastermind where founders can come and meet with me or others from the Rocky Venture Club staff and literally bring up any current [00:13:00] challenge they have with their venture frequently it’s about funding, but not always. And I know that because of the University because of the general business community, Fort Collins where only seeing a tiny tiny fraction of what’s really possible in Fort Collins, and so I think the whole objective of Startup Week in Fort Collins is to bring focus and resources and attention and ideas together so that that collaboration can then really produce more results for Fort Collins. Vanessa Pagan: That’s wonderful Barbara that leads me to my next question of what advice would you give to a first-time attendee coming to Startup week? Barbara Bauer: Oh go to as many events as possible and take a look at the entire agenda and pick out the ones that match what your current priorities are. Because there are so many different things that you can attend as an example [00:14:00] my colleague Dave Harris from Rockies Venture Club he will be doing a session how to pitch and that’s an essential opportunity for any early-stage founder who thinks they’re going to get front of an investor. I mean we do events to help entrepreneurs learn how to pitch all the time and many entrepreneurs come in with what they think is the right pitch, but they haven’t really understood it from what the investor is looking for and we really want to save them a lot of time and energy and we certainly don’t want them to fail when they get in front of an investor, and so take a look at the entire agenda of events and pick the ones that are that really are aligned with what your current priorities are. And sign up early. Vanessa Pagan: That’s great Barbara. What would you say is your vision for the future of Fort Collins? Barbara Bauer: Oh, my goodness. It’s one of the most powerful economic development engines in the state. It has [00:15:00] incredible traditional agriculture and natural resource assets. It’s got the university in the university is really an amazing economic development engine. I think we haven’t yet fully exploited all of the ways that we could collaborate and gotten opportunities events and activities that might start in startup week, but continues through the year because entrepreneurs and investors won’t just need one week a year. You know we need a full calendar of events that really bring the entire community together wonderful. Vanessa Pagan: Thank you, Barbara, and your session is Monday February 26th at 11 a.m.. Ask Me Anything Women Investors and Angels. Thank you so much for joining me. Barbara Bauer: Oh you’re welcome. Thank you. It was a pleasure. Vanessa Pagan: I’m on the line with Emily Wilson director of communication for Innosphere. Hi Emily. Vanessa Pagan: Thanks for being here. [00:16:00] There are several sessions going on with innosphere for Startup Week, and I wanted to mention that on Thursday March 1st at noon is a session called Raising Capital for Your Company’s Successful Exit How your merger and acquisition strategies affect Capital with PJ Williams. Could you talk a little bit about what that course is about? Emily Wilson: Yeah? We’re really excited about Techstars Startup Week, Fort Collins this year because what Innosphere is doing is really opening the type of curriculum and sessions that we usually provide to our client companies, but for some of these sessions we’re opening it up to the broader community, so they can get an inside peek into the issues and struggles that high-tech entrepreneurs go through on a daily basis. So this is one of the sessions we’re excited about to invite startup week participants to attend here at Innosphere and PJ Williams is the Innosphere staff person leading that session and he’s here with me [00:17:00] today to talk more about it. PJ Willams: Hello. Are you doing? Vanessa Pagan: I’m doing great. Thanks for being here. PJ Willams: I’m glad to do it, so I’ve only said you know we’re really excited about this opportunity and for the session obvious speaking yet, you know what we want to focus on is for startup companies and Colorado here. We really want to help them be focused on strategic planning from the beginning. You know as a startup startup company have a lot going on a lot to manage if you’re single founder. There’s so many requests for your time and sometimes you get so focused on the short-term you don’t have time to plan for the long-term and when you’re building your business we just want to make sure that they always have a plan for where they want to take their business. They have goals laid out and strategic plan to get there and so really we just want to point out some steps helping them think about how to do equity modeling how to do financial forecast, how to know when and who to talk to from a potential investment standpoint. I’m in really just help them create a plan to achieve the success of looking forward their company. Vanessa Pagan: Excellent PJ if there was something you could share as a one of your lessons learned from your career. What could you share with start-up attendees? PJ Willams: I think it goes back to what I just talked about a lot is just you know sometimes a company will sit there and again be focused on the short-term and take a action today or make a decision today and not think about how it’s going to affect them down the line, and you know those decisions could cost them money cause some equity cost them customers whatever it may be and so again wanting to always think about both the short-term and the long-term in conjunction with one another decisions for the company can be made. Vanessa Pagan: That’s great. Thank you so much for sharing. Emily, there is another session that innosphere is hosting on Tuesday February 27 at 10:15 a.m. called from Ideas to a business establishing your competitive Advantage. How your culture and investment philosophy defines your strategic competitive Advantage with [00:19:00] Bud Michael. Could you talk a little bit about what that Workshop is about? Emily Wilson: Yeah definitely so we are packing a lot of information into two hours here from 10:15 to 12:15. For all of our sessions we usually always try to keep it to one hour, but there’s so much good information in this topic. We really wanted to take advantage of everyone being excited about events during this week and have a two hour session on this topic to talk about beachhead markets and the tools that entrepreneurs need to really choose and focus on their beachhead market so that they’re not all over the place also building scale and to talk about some laws that impact your company’s scale and then we’ll also talk a lot about customer development interviews how to go about those, and how your customer development interviews affect your validation of the product you’re looking to achieve and Bud Michael who’s leading this session he runs our Enterprise software so B2B software program and also works with hardware companies. [00:20:00] So he’s a really valuable resource as well when it comes to just being a mentor and advisor in our community to software and Hardware startups. Vanessa Pagan: That’s great and there’s also a session on Thursday March 1st at 10:30 a.m.. Called Investor Relations with Doug Johnson. Could you talk a little bit about what that Workshop is about? PJ Willams: Yeah, so what this topic is about covering investor relations is really helping companies understand the difference to investors that are out there when and how to engage with those investors. The expectations those investors will have from a due diligence perspective and then post successful investment from one of these investors. How do you manage the ongoing relationship? How do you communicate? How things are going with the company? How do you communicate Financial Health of the company? Just wanting to make sure that you stay engaged with your investors to build that relationship. Emily Wilson: so we here at Innosphere we definitely are looking into the future because now that Innosphere has been around we’re approaching 20 years in operation we definitely want to be here in another 20 years. And so long-term financial sustainability and building a program that enhance job creation and entrepreneurship in Northern, Colorado are extremely important for us specifically when it comes to the life science industry we’re really looking to build up capacity there. Not only in programs, but also in facilities to expand lab space so that entrepreneurs that are in life science companies have the facilities they need in order to grow their biosciences and Innosphere has locations all along the Front Range in Colorado to better support all Colorado entrepreneurs, but we will always be headquartered here in Fort Collins. Vanessa Pagan: Is there anything that you either of you would like to share that we didn’t get a chance to cover in the the questions here? Vanessa Pagan: Are those on Monday, Mentor Monday? Emily Wilson: Yes so if you have a lot of specific questions, maybe when it comes to needing advice someone with a law background or marketing background or Business Development background check out those mentoring hours and sign up for those. Vanessa Pagan: This great I’m so glad that you were able to tell all about the different activities and sessions that Innosphere is participating in with Startup week. That’s a wonderful resource. Thank you. Emily Wilson: Yeah, thank you so much for having us. PJ Willams: You’re very welcome. Take care. Vanessa Pagan: On the line I have Cindy Skalicky, who is the owner of On Point Communication. She is doing a speaking session on Thursday March 1st at noon called Master Your Message. How your communication adjusts as your startup grows. Hi Cindy. Cindy Skalicky: Hi. How are you Vanessa? Vanessa Pagan: I am doing great. Thanks for being here. Cindy Skalicky: You’re welcome. Thanks for having me. Vanessa Pagan: What would you [00:25:00] say you hope that people get out of coming to start up with there’s going to be so much going on during this whole week and all kinds of different areas. What do you hope people get by being a part of it? Cindy Skalicky: That’s a great question. I would say I hope that people come to Fort Collins Startup Week and get motivation to press on with whatever their current project or venture is. I hope they get community connections with people that they haven’t met before that can help them further their idea or business, and I also hope they get thought-provoking events that are put on by really great speakers who can help others really build in some of the places. Maybe they’re not able to build by themselves where a great community and Fort Collins is an excellent place for people to connect grow and thrive. Vanessa Pagan: Of the people who get to come to your session specifically. What do you hope that they leave with? Cindy Skalicky: Absolutely. I hope that when people come to my session they bring with them a sense of awareness about [00:26:00] themselves for one because what I’m going to do is walk people through three different stages of communication, but I have seen across all kinds of different startups a lot of times when people start a new business, consulting agency whatever it might be. They begin with networking conversations, and so a lot of people go out have a lot of coffees, lots of one-on-one conversations, so those are unique because there’s the non-verbal and the verbal component of a coffee conversation and you want to be able to master that so once you’ve really gotten a good Network going you want to get your idea out there in a more professional way. A lot of the companies I work with are getting ready to do some pitch competitions for example, and so we’re doing a pitch competition at the startup week, which I’m really excited about and that’s an area that I definitely help people achieve message mastery by doing I help them with pitch deck. disconnects in terms of slide decks, presentation presence, delivery and [00:27:00] importantly how to rehearse that delivery and then the third piece if you really get beyond that pitch you had investment interest maybe some fat checks right that everybody would love to put in their pocket. It’s time to go out and do some media interviews and consider how you’re going to disseminate your message through press release writing and social media platform messaging and those are some larger stage areas where messaging is really important. So there’s a progression from small to medium to large essentially and I hope people will come with some ideas of how they can do that. Vanessa Pagan: That’s awesome that gives people a chance to say wherever you are on your journey of your startup or your projects or your mission that there’s a message that can be tailored just for them. Cindy Skalicky: Exactly so that’s going to be our focus and I’m looking forward to seeing where everybody is will have a chance to stand up and do introduction right then so you can practice a little bit and get friendly feedback, and [00:28:00] we’ll get some strategies and action-oriented tips by the time they leave the room. Vanessa Pagan: Awesome, okay, I have one more minute and my last question is Cindy, I know you’re from Chicago right? So you are one of the wonderful people who have been attracted by the magnetism Fort Collins. What would you say is your idea of the future of the city? Cindy Skalicky: That’s a great question so when I started to work with startups in Fort Collins over the past few years it was immediately the case that I saw the rich culture that was here. There are just so many wonderful. People with innovative ideas and a real grit to get it done. The other piece is the collaborative nature that I noticed right away. People are so giving and compassionate about ideas and the time that they will spend with you to just talk ideas around so it’s a rich culture for startups so the vision when I think about Fort [00:29:00] Collins, I just know that there’s so much potential here. We are definitely a star on the map when it comes to places where startups should grow and then go. So for me as a pitch coach. It’s my goal to be a part of that vision and help speakers get on the stage and nail it so that they can get their investment and their business will grow and they can expand to the to the goals that they’ve created for themselves and their business and ultimately grow the economy. I think it’s a wonderful week to celebrate that. Vanessa Pagan: Thank you so much for being on the line Cindy. Cindy Skalicky: You’re welcome. Thank you Vanessa my pleasure. Vanessa Pagan: On the line. I have Joe Somodi who is the founder and producer of FoCo Speaks Out! He is leading a speaking session for FoCo Speaks Out on February 26th, which is Monday at 3 p.m.. Hi Joe. Joe Somodi: Hey, how’s it going? Vanessa Pagan: It’s going great. Can you tell us a little bit about what you think attendees can expect out FoCo Speaks Out? Joe Somodi: I think they’re going to get a flavour [00:30:00] of what the larger presentation was on December 6th. We had a 90-minute presentation we held at a local theater in Fort Collins and with an amazing reception of almost 200 people that showed in a theater that sits 116. And they’re going to get a flavour of what that like after that then we’ll get a chance to really dig deep and have a dialogue around the potentiality for cultural change of this kind of idea because what we’re really looking for Vanessa is a way to galvanize a group of people community members who really want to see social change around social justice, more equality, more diversity more equity, and it’s really important that we get clear on those paths at possibilities, and that’s where the group will come in. We really want everyone to be very dynamically involved in interaction and we’re going to create 30 minutes of discussion around that. Vanessa Pagan: Sounds great, and it sounds very interactive a lot of energy in terms of bringing ideas together with the the ability to network and have community building. Joe Somodi: Yeah, I [00:31:00] mean this is really about being a part of the solution so it doesn’t necessarily mean that you’re going to be involved in that part of it, but you definitely can bring your ideas to the table and we’d love to hear how you’ve seen it done before or even just spontaneous ideas that come up to you as you see the presentation. I’m going to show up a very quick 3-minute video that I created from the December 6 event so people can actually see what happened there and get energized by that but mostly I want people to be a part of the pulse of this conversation because there’s so much positivity in Fort Collins around this concept. Lots of different types of groups of people want to be involved in this. Meaning the city of Fort Collins to foundations to corporations, so it’s important for me to hear from community members how they see this happening, and how it can be effective. Vanessa Pagan: That’s great. What would you say to someone attending startup week for the first time there’s going to be over a hundred and thirty sessions and over a hundred different speakers. What would you tell the person who’s coming for the first time? Joe Somodi: Be very open to listening and writing lots of notes [00:32:00] and being very bold with shaking hands and being uncomfortable when you shake those hands and being ready to ask intriguing questions to people about their life, and not make it so centric about you necessarily, and what you need, but really be open just to hearing people’s stories getting people talking about what their life is all about and what they’ve been up to and if you kind of distance yourself from your own agenda you can get out of the way a little bit and just allow the kind of the fluidity of this kind of event all these amazing people who are coming together to really come to you and let inspiration lead you in that way, and then maybe down the road after the whole event over with you’ll start to see where the alignment is naturally, and if you find one or two amazing alignments over this week you’ve done a lot for your life. And and I would say that’s a that’s a huge win on your part. Vanessa Pagan: Awesome. Joe. Can you tell us a little bit about the vision that you have for the future of Fort Collins? Joe Somodi: I see a lot of diverse leaders in our community, where [00:33:00] business businesses are run by diverse leaders, the city staff and council members are diverse as well. So there’s a sense of nurturing those leaders keeping people in our community is really important, so we want to create an environment where people want to stay for decades so that they’re willing to invest their energy and their talents into this community and I also see a time where we don’t hear hate. We don’t hear intolerances that people can handle themselves with a lot more grace and peace and love. And whatever differences that we see and the community around us we can hold those in a more special place in our body in our mind in our spirit. So it doesn’t cause more tension and so that we can be more welcoming to the homeless. We can be more welcoming to all the different kinds of people that want to live here that makes it makes everybody feel like they matter. Vanessa Pagan: And Joe if there was someone that you could recognize for the hard work and effort that they’ve done to make Fort [00:34:00] Collins the great City that it is right now. Who would you want to recognize? Joe Somodi: That’s a really great question, Vanessa. I’m not going to actually answer that specifically with one person. I would say that what I’m experiencing from the community is everyone’s good and unique flavor and unique voice and unique talent, and I’m seeing those people who really want to make a difference they’re stepping out there. They’re getting into their discomfort. They’re dealing with the challenges of building something in this community, but they’re moving through all those challenges, and they’re finding a way to share their voice in their talent people are doing that through music, people are doing that through art people are doing that through creating a business. People are doing that in small ways in this community, so I really feel like I’m seeing a lot of people wanting to be more invested in Fort Collins, and I think that’s the thing that matters. And that we should all feel really encouraged by where’s my voice. Where’s my talent? How can I move it forward? Pay it forward to this community because that’s what’s going to make it really work down the road. We can be a little [00:35:00] less self focused and a little bit more group community focus, and I think that’s the future. Vanessa Pagan: That was a great answer. Thanks. Joe. Joe Somodi: Yeah, thank you Vanessa. Vanessa Pagan: I’m on the line with Peggy Lyle. She’s the director of the downtown Fort Collins creative district and an organizer of ArtUp Week. Hi Peggy. Vanessa Pagan: You are moderating a session on Tuesday February 27th at noon, Plugged In: be part of City of Fort Collins Arts and Public Arts Programs. Can you tell us a little bit about what you hope attendees get from the session your moderating? Peggy Lyle: Well, I would love to make sure that people have a sense of how they can be engaged in our community and especially in comes from wonderful programs at the city of Fort Collins offers for artists to make public art, be engaged and really connect with other artists. Vanessa Pagan: That’s great, and what do you hope attendees get out of coming to our top week and startup week? Vanessa Pagan: And Peggy from your background and experience could you share with us one of your top lessons learned? Peggy Lyle: Yeah, definitely my top lessons learned I think when it’s thinking about artists and creatives. I think one of the things that happens is people often are worried about being in business and that somehow that will violate their art or their [00:37:00] passion, and I think it’s just the opposite. They need to think of themselves as business people and use some of the conventional tools so that they can have a successful career in what they love. And in vice versa is people don’t consider themselves creative sometimes I think being able to be creative about your approaches makes you more holistic. So at the end of the day really both entities need each other to be successful in their businesses as far as my own personal experience I think plan really well, but then be flexible. So you know what kind of you’re going for you’ve got your strategic goals set out. You know your business, but then when another opportunity comes your way or something else interferes with your plans you’re still mobile enough to be successful and to kind of modify your plan. Vanessa Pagan: That’s a great answer. I actually really like the idea that art and business aren’t exclusive to each other and that they can be in the same, the same person or same [00:38:00] organization. So I’m glad that you’re you’re sharing that. Peggy. Could you share with us your vision of what the future of Fort Collins can looks like? Peggy Lyle: Yeah, I think it Fort Collins has it really on an amazing trajectory as the city I think we have so many entrepreneurs here so many people thinking creatively about what they can do in the world we tend to be a city of starters. Which I love I think I’d like to see us sort of expand our city’s brand to encompass creativity so that we’re really raising that quintessential way of life, and why people choose to live in a community all creative and that includes Arts that includes you know passions like brewing beer so I think expanding notions of what we are as a city I think that’s really important. I’d like to see us have even more kind of world-class campuses, so maybe having creative activity [00:39:00] campuses you know Community Arts Center. More campuses like the music District would be amazing. You know having more murals and displays of kind of our culture around. So again immersing the entire city and all of our wonderful passions just putting them on display and how can we do that. I also think it would be wonderful to kind of focus on our reputation maybe of cultivating new talent and sowing the seeds for people to really grow and be fostered here they may not stay the entire time, and I think that’s a challenge to get them to stay. So how can we be okay with being the place that people are incubated and that people start and we cultivate that even if they move on to larger markets after that. I think that’s a great thing for us to embrace about ourselves and not worry about trying to keep everyone here. We’ve got a lot of new talent coming up all the time. Other great things. I’d love to see performs. I’d love to see a little more Innovative technology kind of deployed into transportation [00:40:00] into some of our sort of our systems, so we’re going to be Innovative I want to see Innovative and creative signs I want to see more unique thinking kind of like what we’ve had with Mason Street Corridor, and you know our broadband and some of our things like that I like to continue to see Fort Collins excel in that range. Vanessa Pagan: That’s a great answer you have you’ve got a vision for every part of the future. I love it. Peggy Lyle: Well. Yeah, I mean I guess I I’ve been here for a while. I also I get one last thing that I would love it. 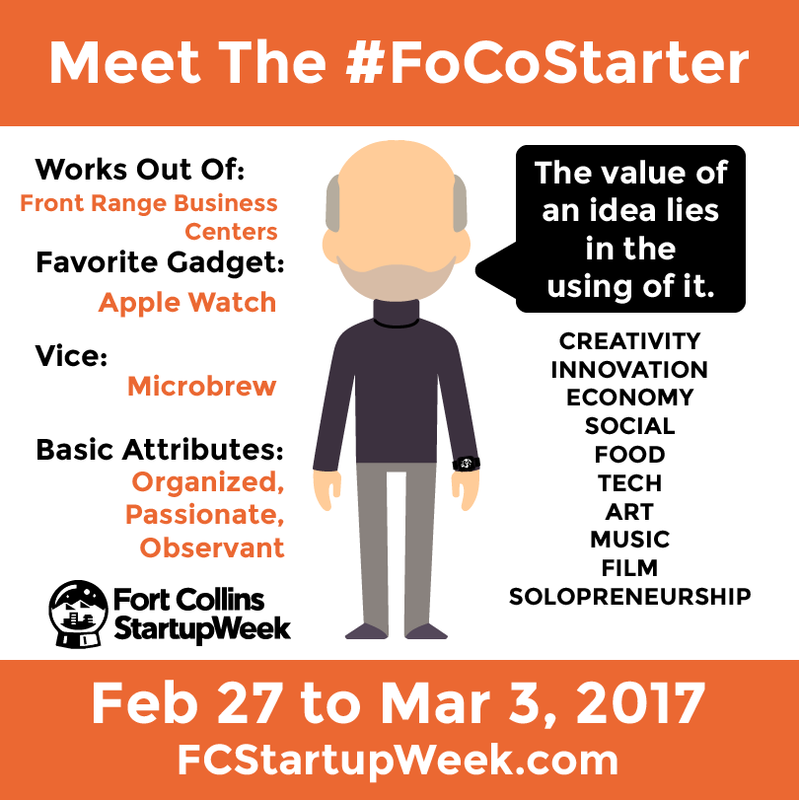 I would love for Fort Collins to not just be a place of starter, but be a place of finishers and so that when we start endeavors. Maybe they’re more collaborative endeavors, and them are consolidated so that resources go to one place and really it thrives instead of five little things all starting and trying to kind of unfortunately probably compete with each other. We just have like one or two big things start and that way we can really triple down and succeed together. I think that and I know the cross spent all the different like nonprofits and [00:41:00] for-profit businesses. Just seeing those efforts kind of working together. We collaborate, but we don’t always put it under one roof, and I think that would be beneficial. Vanessa Pagan: That’s a great perspective. Peggy, if you could give recognition to someone or an organization in Fort Collins that you feel has not been recognized who would you like to give a shout out to? Peggy Lyle: Oh gosh, you know one that I think really really deserves recognition is the Larimer County Small Business Development Center. Really just such an amazing resource, but I don’t know if everyone in our business Community knows is here. I mean almost like all of their consulting is free. You know if you’re getting free business advice from people who have expertise and so many different areas. They have workshops. It’s this great accelerator that people can use if you’re a brand new start up and have zero business knowledge, or you can go in as an established business and say Hey, I want to take it to the next level or [00:42:00] you know I I’ve been in business for ten years and things, are you know sort of not staying fresh, and I business needs some help. Or I need to understand my numbers again. Why are my numbers going down that all that kind of support is in this amazing little office over in the Innosphere building, and so, I wish that more people knew about them, and it could take advantage of them. Vanessa Pagan: That’s a great shout out. Peggy Lyle: Yeah, and again it’s it’s really accessible to everybody so and with more in a more engagement they can probably provide even more kind of services to the community, but I think it’s something I worked for the downtown, Fort Collins Business Association for 13 years, and we were Partners, but you know between that and the Chamber and all these other business-oriented resources in town. I wish that they were funneling even more people to the center so that they could really do their businesses justice and take it to that next level that be great. Vanessa Pagan: Wonderful Peggy. You did it. This is the whole interview all the questions answered. [00:43:00] Alright, Peggy. thanks so much. I will see you face-to-face. Peggy Lyle: Yeah. Thank you so much. OK. Have a great day.